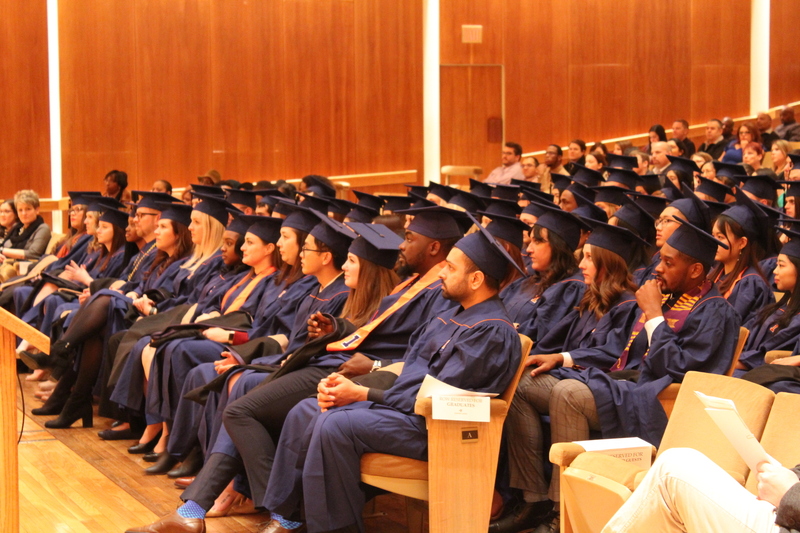 On Saturday, December 15th, the School of Labor and Employment Relations celebrated the commencement of 72 students completing their Masters of Human Resource and Industrial Relations at Krannert Center for the Performing Arts’ Follinger Great Hall. In addition to our on-campus graduates, we welcomed the second cohort of our online program and 11 of the 20 students also participated in the convocation ceremony. During the ceremony graduates were inspired by our commencement speaker, Daniel Spaulding, MHRIR ‘00, who’s talk ‘Turkey and other relevant topics in building your career’ inspired our graduates. As a follow up, Christine Kurt, MHRIR ’18, shared memorable words about her and her classmate’s time at the School. . Immediately following the ceremony, our graduates and their families celebrated the completion of the program with a reception in the Krannert Center lobby. We couldn’t be more excited to follow these graduates journey. Please join us in welcoming the students listed below to the LER Family! For photos from the weekend, please visit our 2018 Graduation Photo Album.